The morning’s weather looked a little sketchy, but the rain held off and it turned out to be beautiful here in Central TX. 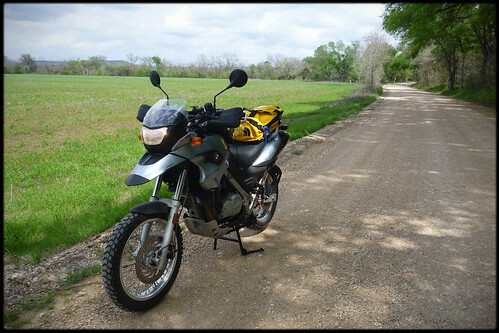 I was itching to try out my new tires on some dirt but didn’t want to ride too far, so I decided to just wander and hopefully I’d run across some nice dirt roads. With that in mind I went north from my home in Cedar Park, up Reagan Blvd. and then took some back roads to Florence. I was a tiny bit worried about the front tire since I changed it myself, but it felt pretty good at highway speeds. When decelerating, the Heidenau K60 tire was a bit louder than the Tourance and there was a some vibration, but nothing crazy. I continued up Highway 195 north and saw a sign for Sharp Cemetery. The road looked like it might be interesting on the GPS so I pulled off the highway and almost immediately there was a cattle guard and Sharp Cemetery Road turned into hard-packed dirt. Just what I was looking for! The road looked well traveled and smooth and the views were very nice. The sun was coming through the clouds and overhanging trees making it almost perfect riding, for me at least. 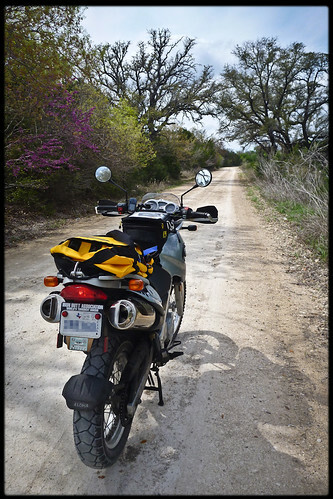 The tires are well suited to this kind of road and I didn’t feel much wiggle. I have nothing to compare the tire’s performance to, but the reputation of them did instill some confidence. I followed the road until it ended at the cemetery itself. I spent a few minutes there reading the historical marker and taking a break, then headed back the way I came. The weather was perfect, about 76F on my thermometer and a nice combination of sun and clouds. I flipped up the chin of the modular helmet and enjoyed the fresh air and smell of wildflowers. This was the kind of riding I really enjoyed! I wish the road went on for several miles, but I’ll take this little bit of heaven anytime. Back on the pavement I headed west along FM2670 and then took a right on Maxdale Road. I rode over a cattle guard and the road turned to gravel/dirt and I saw a huge military transport plane gaining altitude in the distance. It occurred to me that I might have ridden into Ft. Hood and that I should probably turn back. So I made a u-turn and headed back south. 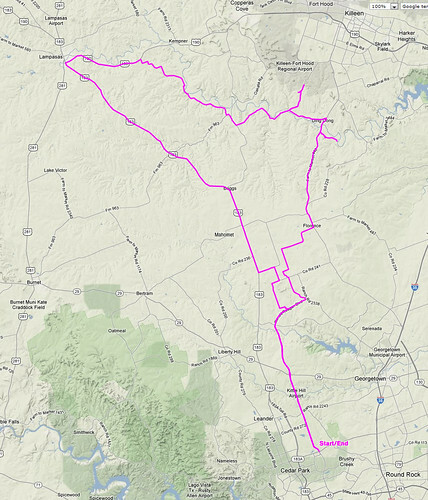 I guess it was ok for me to be in that area as I found out later that it is the Killeen airport area. 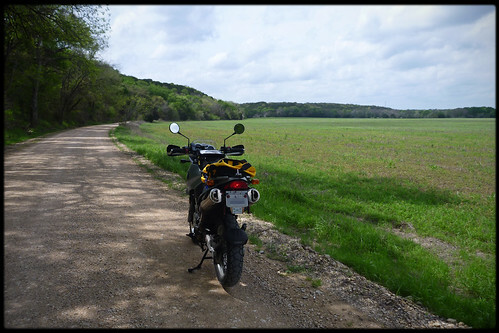 At any rate, I continued along Maxdale Road to Oakalla and then I saw on the GPS what looked like a fun road that headed off north. 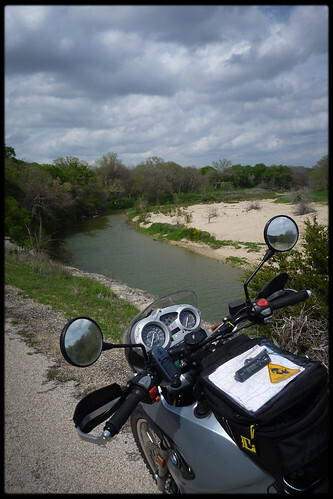 CR223 was another little gem of a road which wound past ranches and farms, then met up with the Lampasas River. There were a couple teensy water crossings (just enough to get your feet splashed) and lots of gorgeous scenery. 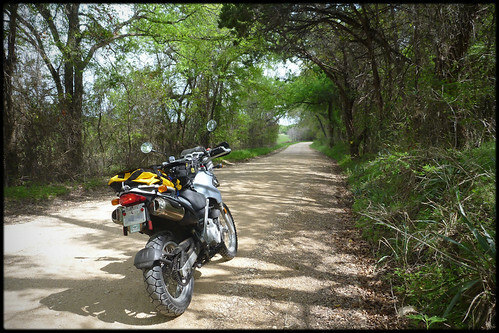 CR19 turned into hard-packed dirt again, and I enjoyed more of the perfect riding. The combination of weather, light dirt, and scenery was awesome and I was stoked.